The dream of every computer geek is a technical and technological excellence, more memory, larger hard disk, and higher speed. We have committed on the GR8BIT specifications page that GR8BIT is expected to work at 4-20MHz, and here we will see if this promise is achieved, and if it is achievable. Warning: accelerated GR8BIT will not add value if you use machine for gaming. All the MSX games will work fine at the standard 3.58MHz clock speed. Even more, above specific clocking frequency level accelerated GR8BIT is not guaranteed to work 100% properly in terms of representation of the graphics. Accelerated GR8BIT will add real value in terms of computing power. There's absolutely no goal to make GR8BIT a super-computer, and this document rather describes technological experiment and endeavor to show the flexibility of the MSX architecture and give another piece of important experience. Special thanks to Alwin Henseler (NL) for sharing his experience about his Super-Turbo, for his advices on circuit design and for reviewing this KB article. If we are talking about the computer's speed, we need to consider local and global clocks using within it. Clock signal is fed to the CPU, to the GR8BUS and all devices attached to it, to slowdown circuit and to the slot board (and thus devices within slots 1 and 2). By default there's one global clock signal, supplied by the VDP to the GR8BUS and spread throughout the system (CPU board's SJ1 and SJ7 are closed, and video board's SJ1 is closed). It equals to 3.58MHz, and strobes slowdown circuit in terms of wait state count, M1 wait state processing, serves as reference frequency for PSG on the I/O board, SCC in the slot board or converter board, and other devices. 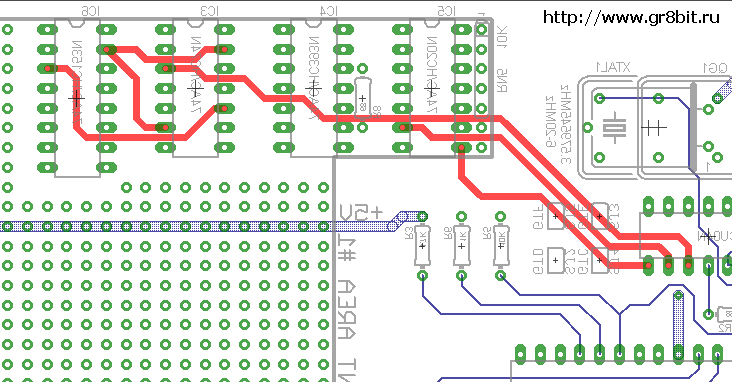 If we change GR8BUS clocking speed, it will not affect PSG as I/O board is designed to hold dedicated clock generation circuit, but other devices will be affected. 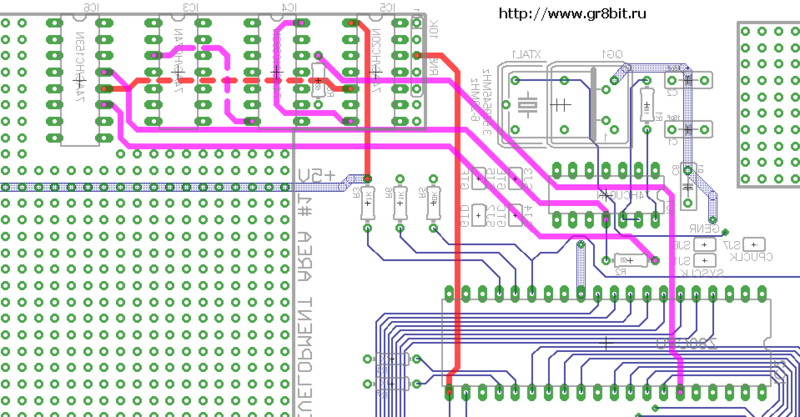 CPU board is also designed to hold dedicated clock generation circuit, and it can be used to supply global clock signal to the GR8BUS (if CPU board's IC1 and other related elements are installed, and video board's SJ1 is open). You can vary system speed by varying nominal of the XTAL1. But increasing speed will decrease clock period relative to the specific chip specifications, and those chips may not survive proper operation. Let's consider the most vital case, video display processor, which is required for proper system operation and dialogue between you and your GR8BIT. VDP is driven by the IORQ signal (fig. 1). This signal has a length (taccess_cycle), has active phase (tactive), and inactive phase (tinactive). Let's simplify situation and assume that two consecutive IORQ signals address VDP. During the active phase, VDP samples data from the data bus or puts its own data on the data bus. VDP works with specific speed and if tactive is less than it can serve, VDP will not be able to sample correct data from the data bus (on CPU write), as well as be too late to supply its data to the CPU (on CPU read). If you'll look into VDP datasheet, this minimal time equals to 186 nanoseconds and typical value - 700ns (page 121). Inactive phase timing is also vitally important - VDP is processing information during this period of time. It may need to read data from the video memory, or perform specific hardware-accelerated operation. Look into the same data sheet, and you will see that minimal inactivity time varies between 2µs and 8µs (depends on the VDP command phase and operation requested). At CPU clock speed of 3.58Mhz, 8µs equals to 28.5 T-cycles. To compare, one NOP command takes 4 T-cycles, two EX (SP),HL command takes 38 cycles. Therefore, increasing GR8BIT system clock frequency decreases length of T-Cycle, and thus effective time dedicated for VDP data sampling and processing, and at some critical value VDP stops working correctly. First it exhibits as small artifacts on the screen, and as speed increases makes machine stop working properly. With GR8BIT you have flexibility to adjust length of the active phase of the control signal using its slowdown circuit, but it has limitation of 15 additional wait states, and does not allow lengthening time of signal inactivity. 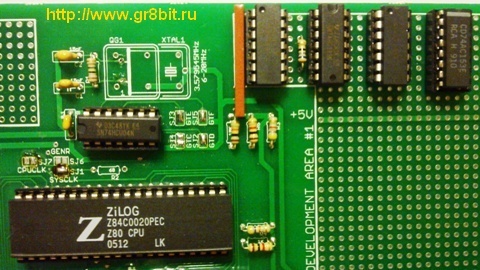 Put IC1 in (supplied within your GR8BOX), install CPU board into GR8BIT, and start it to ensure that it works. The drawback of this implementation that global clock frequency changes, leading to changed pitch of PSG and SCC music. Your homework: try different crystals to see at which its nominal you notice artifacts on the screen/GR8BIT does not start, varying number of wait-states inserted using SW1 main board's switch. Also ensure that this switch has position #5 turned off (for modified slowdown circuit - turned on), and position #6 turned on (so that additional wait-states would apply also to PPI and RTC access cycles). This option has a right to exist, however after implementing it and testing the system we decided to discard this option completely for the reason that it was almost impossible to play games which heavily used VDP and PSG resources due to game play snatching including video effects and music/audio effects. The idea is that system clock stops for predefined period of clock cycles when specific conditions are met - we used condition of IORQ (I/O port access) deactivation to accommodate the lengthened inactivity period of time (activity period of time is still variable using slowdown circuit of the main board). If you are interested to know more about this option, or interested in schematic, please let us know. It requires 3 additional chips to be installed onto CPU board, and some other very minor modifications. This option is more complicated to implement, but allows to significantly speed systems' computing power without adverse effects exhibited by the option #2. 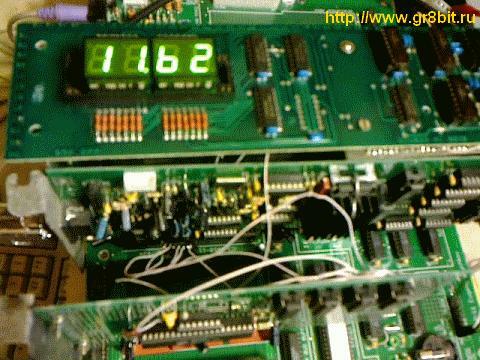 In our tests the maximal CPU clocking frequency we achieved with proper system (and VDP in particular) is 12MHz. With crystal of 14.318MHz system did not start at all in its maximal (in this design version) wait-state and brake settings configuration. With 10MHz Z80 CPU provided within your GR8BIT you can use 10MHz crystal, with 20MHz CPU we recommend to use 12MHz crystal. After modification you will have GR8BIT storage subsystem and most Konami games working (with proper sound). In gaming mode (with massive VDP access) average speed of the CPU is braked to 3.58MHz, in computational mode (when CPU does not perform port I/O access) CPU runs at full speed equal to the value of the crystal of the CPU board. We used simple condition to trigger CPU speed braking - activation of the IORQ line. As soon as it activates, system starts getting clock signal from another, "low speed" clock source, which ensures proper operation of the external and internal devices like VDP (ports 98h-9bh), RTC (ports 0b4h-0b5h), PPI (ports 0a8h-0abh), GR8BIT storage subsystem (ports 0a4h-0a5h) and many others. As you will see from the explanation below, you have a freedom to choose other (additional) signals to trigger braking, and have some options to tune how braking system works and for which time CPU clock signal is braked. and one output signal, CPUCLK, which clocks CPU (and some other circuits if you choose so - read on). IC4A/IC4B: these are counters which count clock cycles supplied to them, and present number of cycles counted on their outputs in binary representation. These two 4-bit binary counter elements are daisy-chained to form one 8-bit binary counter. This daisy-chained structure outputs a positive-edge impulse BRAKE. Minimal number of cycles counted (if you choose to connect pin 3 of IC5A to the pin 3 of IC4A, is 0 or 1/2 (depends on the phase of its input clock at pin 1), maximal number of cycles counted (if you choose to connect pin BRAKE to the pin 8 of IC4B) is 128 or 128.5 its input clock cycles at the pin 1 of IC4A. The selection of the number of cycles which activates signal BRAKE can only be a power of 2 - 0 (20, pin 3), 2 (21, pin 4), 4 (22, pin 5), 8 (23, pin 6), 16 (24, pin 11), 32 (25, pin 10), 64 (26, pin 9) and 128 (27, pin 8). It does not look like a great set of options, but it is enough to flat-tune to the acceptable level of system reliability. You can add another counter in the same way as IC4, and increase number of cycles counted above 7th power of 2. Moreover, you have a flexibility to choose the IC4A clock source, which is used to calculate number of cycles - either CLKHI, or CLKLO - and it is clear that with CLKHI you can set number of cycles versus brake time more precisely, however maximal absolute interval of time for IC4 to generate strobe/triggering signal will decrease appropriately. 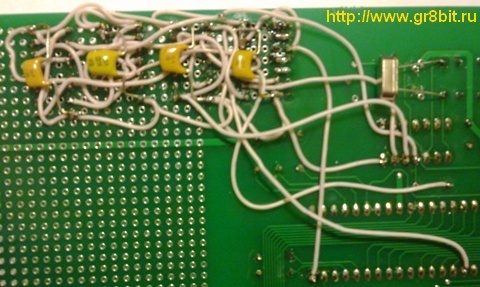 IC3A/IC3B/IC6 is a reliable clock switching circuit, developed by the Alwin Henseler (NL), and published and implemented in his Super-Turbo device back in 1998. After the reset condition exact function of the IC5/IC4 depends on how IC4 initialized: if its output connected to BRAKE initialized in high level, IC5B's output is set to 1, counter does not receive clocking signal, and system starts at CLKHI clock; if output connected to BRAKE is initialized in low level, system starts at CLKLO clock, selected clock is passed through IC5B to the counter. As soon as counter reaches the state when output connected to BRAKE becomes high, BRAKE deactivates, clock stops being supplied to the counter, and system runs at CLKHI speed. Thus system reaches stable state of running at CLKHI speed within maximum 255 IC4A's clock cycles (full loop of 256 states minus one). State changes as soon as IORQ (or any other triggering ACTx) signal goes low. It immediately clears the counter setting CRES signal high, also resetting BRAKE signal low, thus system switches to CLKLO now on. This "counter reset" state lasts until respective triggering signal is released (become inactive), and CRES signal goes low. From this time counter starts to count (as chosen clock signal is passed to the IC4A through IC5B). If there's another triggering signal activation occurs, counter IC4 got reset again, and counting restarts. If no following triggering signal occurs within the timeframe when IC4 counter reaches value defined by the connection of the BRAKE line, BRAKE signal goes high, and clock switching circuit starts supplying CLKHI to the CPUCLK line. At the same time IC5B's input 9 becomes low, and disables further counting (IC5B will always output high level to the IC4A clock input). Therefore, when counter reaches predefined number of cycles, it is stopped and system switches to high speed. This state is stable, and changes when any of triggering signals activate next time. Now let's consider how clock switching circuit works. It has three inputs: CLKLO, CLKHI, and BRAKE, and one output, CPUCLK, which is expected to be equal to CLKHI if BRAKE is high level, and CLKLO if BRAKE is low level. After the reset condition, BRAKE is high level for a long time (relative to CLKHI and CLKLO), and whatever frequency is present on IC6's pin 7 (STAGE) , IC3A is in high state, and IC3B is in high state too (look carefully - you will see that IC3A and IC3B are "daisy-chained" - positive output of IC3A is serving as data input to IC3B, and they both are clocked in by the same signal STAGE). Therefore, IC6 inputs A and B are both in high level, selecting 1C3 input (CLKHI) for STAGE output and 2C3 (also CLKHI) for CPUCLK output. This circuit is in stable state. As soon as BRAKE signal goes active (low), on the next positive edge of CLKHI (which went through IC6's input pin 1C3, out through 1Y output in to STAGE signal), IC3A latches low level. IC3B remains in high level, and IC6's "BA" input pin combination becomes 01 (binary), selecting 1C1 for STAGE signal (CLKLO), and 2C1 for CPUCLK. Please note that at the time, when STAGE goes high and locks low level in IC3A, CPUCLK is equal to STAGE, and also in high level. So when this transition of "BA" is performed, CPUCLK is sourced from input 2C1 which is in high level, and CPUCLK does not go low when CLKHI or CLKLO go low. At this time STAGE is equal to CLKLO, and on the next positive edge of this signal, IC3A does not change state (it is already low as BRAKE is active), but IC3B changes state to low, locking it from IC3A's output. Now combination "BA" of the IC6 source select inputs is equal to 00, and 1C0 is selected for STAGE signal (no change), and 2C0 is selected for the CPUCLK signal (which becomes equal to CLKLO - which just transitioned from low to high level, and is in high level). All further cycles, until BRAKE goes inactive, STAGE is equal to CLKLO, and CPUCLK also equal to CLKLO, supplying low frequency to the CPU. As we see transition was performed seamlessly, with probably small suspension when CPUCLK is high during transition of low level from IC3A output to IC3B's output. When BRAKE goes inactive, on the next positive edge of STAGE (which equals to CLKLO) IC3A locks high level, and "BA" of IC6 becomes 10, switching STAGE to 1C2 (CLKHI) and CPUCLK to 2C2 (high level). The same hint works here - CPUCLK just became high level before switching to 2C2 input, and remain in high level while "BA" is equal to 10. On the next positive edge of STAGE (=CLKHI), IC3B locks high level from output if IC3A, and "BA" becomes 11, switching STAGE to 1C3 (no change, stays CLKHI), and CPUCLK to 2C3 (from high level to CLKHI's high level phase), and CLKHI continues to "clock out" through the CPUCLK line to the CPU, making it run at the full speed. As you see, again, transition between CLKLO and CLKHI was seamless, with probably small suspension at high level. 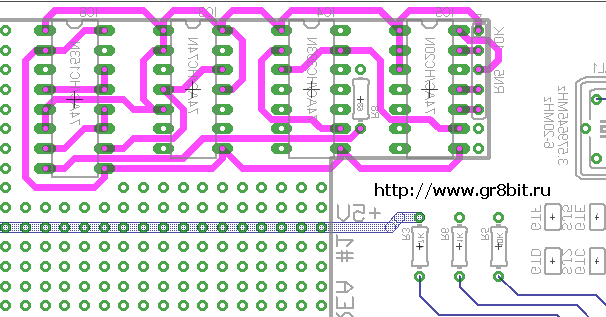 Now, as you understand how the depicted circuit works, let's see how it fits into your GR8BIT. Solder decoupling capacitors in point-to-point manner (fig. 7). Ensure their pins do not short-circuit and any pins/wires in the circuit. 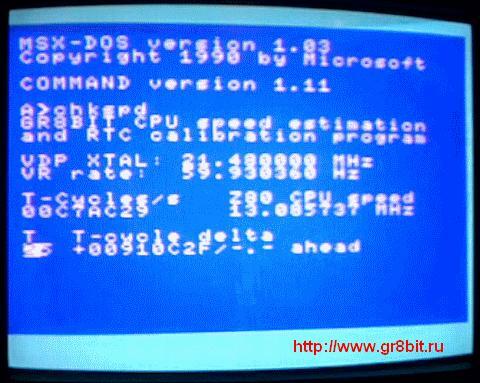 Now your GR8BIT has two clock systems running simultaneously - CLKLO, which is generated by the VDP, and has default frequency of 3.58MHz, and CLKHI, which runs according to the crystal you installed as XTAL1 of the CPU board. See fig. 6 and fig. 7 for the images of our test CPU board. If you recall slowdown circuit is supplied with the clocking signal from the GR8BUS. While slowdown circuit built on IC45 will work properly, M1 wait-state circuit, built on IC16, will get problems. It is designed to be supplied with CPU generated M1 signal and supplied to the CPU clock signal - and it is vitally important because M1 signal phase and actions happen within the specific state of CPU clock signal (there's a positive edge of the clock signal while M1 is active [low] and this low M1 gets properly locked into the IC16A trigger). In our current dual-clock-supply design, IC16A is supplied by the CLKLO, while CPU is supplied with CLKHI, thus correct phase/edge of clock signal on the IC16A's input 3 is not guaranteed throughout the M1 activity time - and it leads to the loss of the M1 CPU cycles wait-state required by the MSX standard. In most circumstances when you have prolonged number of slowdown cycles (set up by SW1 of the main board), this issue will not present problems, but when timing becomes tight (mostly - for VDP) you may notice artifacts on the screen. To fix this issue and make M1 wait-state circuit work properly, you will supply CLKHI to the pins 3 and 11 of the IC16 to ensure that M1 and clock signal supplied coincide in expected way when M1 wait-state is required. Your homework: identify which conductors you have to cut (hint: only two), and air-wires between which points you have to put in (hint: only two). Very similar to the issue described above - CPU cycles become "detached" from their expected GR8BUS clock phases, and cartridges based on DRAM memory will not work (they use clock signal to multiplex address into the DRAM chips). The solution is to supply CPUCLK clock from the braking circuit rather than from GR8BUS, and add triggering signal to braking circuit which would activate it on respective slot access (do not forget ACTx signals are active low). Figure 8. Running CHKSPD on the accelerated GR8BIT: as CHKSPD is not designed for variable speed designs, it displays slightly wrong results. Value of XTAL1 installed is 12MHz, not 13MHz. End of KB0009 "Accelerating your GR8BIT".